New Year’s Resolutions: Get Organized with Pretty Baskets! Hello, everyone! We hope you’re all gearing up for a most festive New Year’s Eve, and had a wonderful Christmas. As we head toward 2014, we all seem to have a mountain of spoken and unspoken (except to ourselves!) New Year’s resolutions. The usual suspects include exercising more, eating more healthfully, spending more time with family and friends, and cutting down on how much time we spend with our televisions. There are usually more specific-to-our-lives resolutions as well, one of which for me is to get all my old family photos stored digitally and shared with everyone who would love to see them. And – as it is every year – one of my biggest resolutions is to get better organized. Don’t get me wrong, it’s not that I fail at this resolution. I accomplish it in some ways, just never completely. When I finally get my paperwork in order, I realize the hall closet is a mess. Once that’s complete, I find there’s a mountain of magazines next to the couch. It’s an ongoing work-in-progress that may never fully realize completion or proper management, but I work on it! Just the other day I was noticing how many little whatnots clutter my bedroom dresser, hall table, kitchen table and bathroom counter. There are receipts, lip balms, spare keys, sunglasses, hand creams, nail polishes and more here, there and everywhere. I want to keep these things within easy reach, but I’m tired of them rolling around, falling down, and just generally cluttering up the place. The obvious solution, that if anyone should be employing it’s me? Gift baskets, of course! As someone who gives a lot of gift baskets and receives a lot of gift baskets, I surely should have employed this method of organization earlier. But hey – I can be a slow learner! I have several empty baskets tucked into a closet that were simply too pretty to donate or toss away, and I’m breaking them out January 1st and cleaning up my act. I’m going to keep one on my vanity for makeup, hair supplies, perfume and such; another near the door for gloves, keys and sunglasses; another on the kitchen counter for dog treats, bag clips and the like; and another still on my nightstand for my novel of the moment and other sleepy time essentials. The best part is that I already have the baskets, so it won’t cost me a thing to get better organized and make my home look a lot better put-together in the process. Did Santa bring you any gift baskets for Christmas, or do you have some from the past tucked away? Clear out your closet and add functional style to whatever spaces serve as a catch-all in your life! And if you have any tips to share for ringing in the New Year with some simple, positive changes, please share in the comments. Shop Our Gift Baskets with Free Shipping – Today Only! 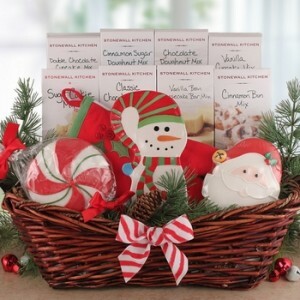 Santa Sweets and Treats Christmas Gift Baskets – Send warm wishes for a holly, jolly Christmas with this spectacular selection, currently on sale for $20 off regular price! The hand decorated cookies are as cute and colorful as can be, and the adorable Snowman spoon rest will be fun to use all winter long. 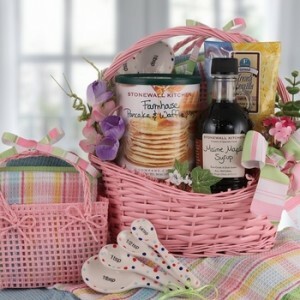 But what makes this gift basket so special is the mixes – all 8 of them! From the decadently indulgent Vanilla Bean Cheesecake Bar Mix, to the crowd-pleasing Double Chocolate Cupcake Mix with Chocolate Frosting, the lucky giftees will have plenty of sweets to share. 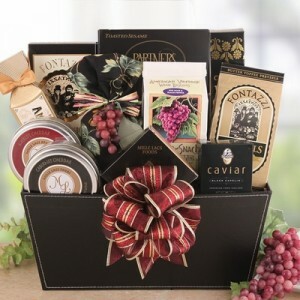 Refined Elegance Holiday Wine Themed Gift – A chic and sleek gift perfect for clients, or anyone you want to impress! The Italian Amaretti Cookies are impossible to resist, not to be outdone by the Fontazzi Butter Toffee Pretzels or the Camembert Cheese. And did we mention the award-winning Wine Glace, or the impossibly posh Caviar? Because you’ll find all that and more, artfully stowed inside a reusable faux leather container. There’s just a few hours left on our gift baskets with free shipping offer, but we have plenty of great gifts to choose from! ‘Tis the season for sharing and caring, and our gift baskets make it marvelously easy no matter the miles between.